Virginia, the 10th American state. This vintage Virginia map covers everything from it’s beautiful beaches to mountain peaks and valleys. The state has been a beautiful place for many to call home. When this vintage Virginia map was drawn, the state had a population of only 2,061,612. Not entirely sure of the accuracy, but the 11th encyclopedia claimed the state was also home to 19,461 foreign-born residents, 354 Indians, 243 Chinese and 10 Japanese. In 2016, the population was 8,411,808 with 0.6% (50,470) Native Americans and 6.5% (546,767) having immigrated from Asian countries. Virginia became the 10th state in 1788. This vintage state map offers a bit of a hide and seek trivia game. While Jamestown is the most well-known of the lost or extinct counties, cities and towns of Virginia; this map includes many others. Since 1910, Alexandria County has become Arlington County, Nansemond County became the independent City of Nansemond which later was consolidated with Suffolk, Princess Anne County was consolidated with the independent City of Virginia Beach and Warwick County became the independent City of Warwick which was later consolidated with Newport News. There were several others, but, I’ll leave them for you to find. This historical map of Virginia also includes pieces of West Virginia, North Carolina, Maryland and Pennsylvania. The Appalachian Mountains are featured in brown where the map-maker added some topographical elements. I’ve left this one as I’ve found it to allow the natural aging of the paper to add to the overall vintage look and feel. 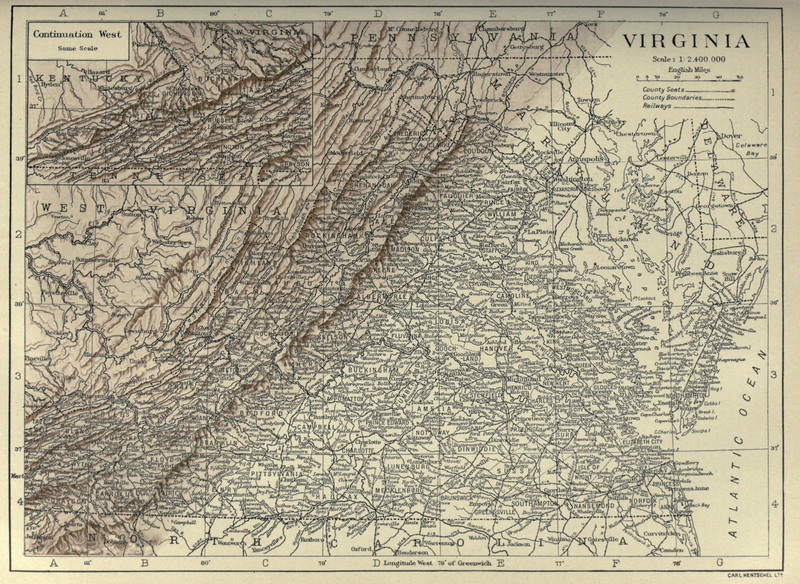 Due to space limitations, the vintage Virginia map shown above is not the full-sized version. Simply click on the map to access the biggest size of this image we have.